A big thank you to everyone for helping to make our dreams come true. Today marks three years since Creative Word Lab opened its inky doors. It’s been a roller coaster ride, but a ton of fun. 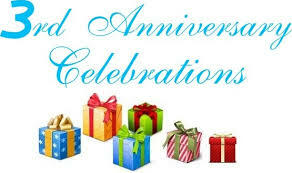 Presents for you on our 3rd anniversary in business! services through the month of June. There’s no better time, then, to get that project done you’ve been wanting to do. Contact us at info(at)creativewordlab(dot)com today! Thanks for getting us this far!